The Longmont Open Space and Trails Master Plan has been prepared by the City of Longmont Community Development Department. The Plan was guided by citizen input and a Staff Advisory Committee. This committee was comprised of City of Longmont staff, representing a variety of Departments, as well as representatives from other neighboring agencies and resource experts. The City’s ordinance that created the Open Space Program is the guiding basis for the Plan. Input from the general public, City staff, the advisory committee, and the consulting team confirms that the ordinance fully and accurately represents the needs and desires of Longmont citizens. 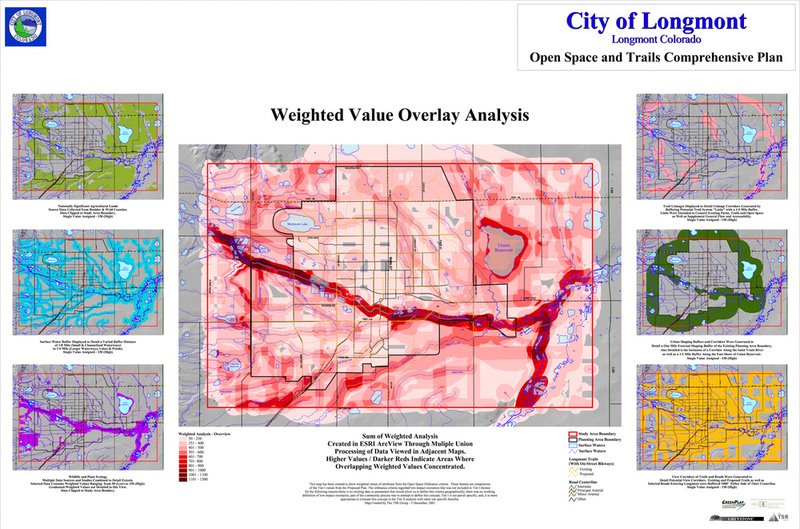 The Open Space Criteria spelled out in the ordinance identifies suitable land for preserving as open space in our study area and has been utilized as the basis for the evaluation process. A citizen survey was widely distributed through the local newspaper and made available at convenient City locations. This was not intended to be a statistically valid sampling, but a method of gauging general public opinion. The guiding basis for this planning process has been the City’s ordinance that created Longmont’s Open Space Program, along with a broad-based participatory process that has included the public and a knowledgeable Staff Advisory Committee representing agencies and interests at the state, county, and municipal levels. The basic concept of the process has been to start with the ordinance, reviewing, testing, and cross checking to verify that it fully and accurately represents the needs and desires of Longmont’s citizens. Based upon input from the consulting team, advisory committee, City staff, and the general public, the ordinance has been determined to stand up very well without the need for amendment or annotation. Input at the public meetings supported equal weighting of the Open Space Ordinance Criteria and the citizen survey revealed a fairly balanced support of all uses, but with conservation and resource based uses as slightly higher ranked priorities. As a result, the study process proceeded with the Open Space Criteria spelled out in the Ordinance, with equal weighting, as the basis for identifying suitable lands for preserving as open space within the study area. The next step was to get a sense of what the people of Longmont thought open space should look and feel like. Where should it be located? What activities or uses should it support? How should it be managed? To get these answers, a series of workshop activities and a citizen survey were conducted. It should be noted that it is the intent of the City of Longmont to only pursue the acquisition of land with willing sellers. Simultaneously, information from existing resource inventories, regional plans, and other data sources was being compiled into a single GIS database and analyzed to determine how the landscape within the study area stacked up against the criteria in the ordinance. The final step was to synthesize the public input with the physical characteristics of the lands within the study area to arrive at a master plan for acquiring and managing land for open space.